Reading and share top 10 famous quotes and sayings about Judgement Day by famous authors and people. Browse top 10 famous quotes and sayings about Judgement Day by most favorite authors. 1. "Every form is an image. Every image is a name. Every name is an attribute, every attribute a verb. Every verb forms the sentence to be read on Judgement Day, from the very Qur'aanulQariim that is found within the breastplate of all that is ‘created' in the form of humankind. 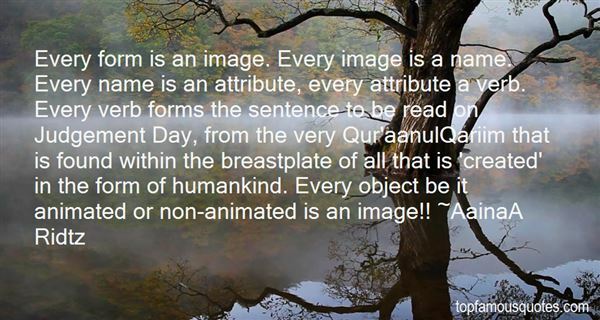 Every object be it animated or non-animated is an image!!" 2. 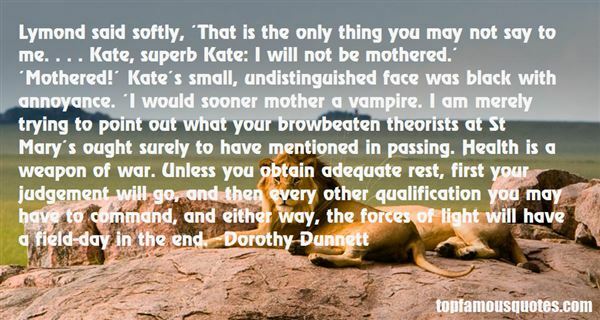 "Lymond said softly, ‘That is the only thing you may not say to me. . . . Kate, superb Kate: I will not be mothered.' ‘Mothered!' Kate's small, undistinguished face was black with annoyance. ‘I would sooner mother a vampire. I am merely trying to point out what your browbeaten theorists at St Mary's ought surely to have mentioned in passing. Health is a weapon of war. Unless you obtain adequate rest, first your judgement will go, and then every other qualification you may have to command, and either way, the forces of light will have a field-day in the end." 3. "By now I was feeling the shame but also defiance. Like here, I'm carrying the banner for all of you who cut off a little piece of cake wanting a big one, who spend a good third of your waking hours feeling bad about your desires, who infect those with whom you work and live with your judgements and pronouncements, you on the program who tally points all day long, every day, let's see, 7 for breakfast, I'm going to need only 3 or 4 for lunch, what the hell can I have for so little, oh, I know, broth and a salad with very little dressing. And broth is good! Yes! So chickeny! That's what we tell ourselves, we who cannot eat air without gaining, we who eat the asparagus longing for the potatoes au gratin, for the fettucine Alfredo, for the pecan pie. And if you're one of those who doesn't, stop right here, you are not invited to the rest of this story." 4. "You should spend more time reading the Good Book and less reading all those novels. What are you going to tell the Lord on Judgement Day when He asks you why you didn't read your bible? Hmm? "I will tell Him that His press agents could have done with a writing lesson or two, I said. To myself." 5. "I picture it like Judgement Day,' he says finally, his eyes on the water. 'We'll rise up out of our bodies and find each other again in spirit form. We'll meet in that new place, all of us together, and first it'll seem strange, and pretty soon it'll seem strange that you could ever lose someone, or get lost." 6. "The unchanging Man of history is wonderfully adaptable cloth by his power of endurance and in his capacity for detachment. The fact seems to be that the play of his destiny is too great for his fears and too mysterious for his understanding. Were the trump of the Last Judgement to sound suddenly on a working day the musician at his piano would go on with his performance of Beethoven's Sonata and the cobbler at his stall stick to his last in undisturbed confidence in the virtues of the leather. And with perfect propriety. For what are we to let ourselves be disturbed by an angel's vengeful music too mighty for our ears and too awful for our terrors ? Thus it happens to us to be struck suddenly by the lightning of wrath. The reader will go on reading if the book pleases him and the critic will go on criticizing with that faculty of detachment born perhaps from a sense of infinite littleness and wich is yet the only faculty that seems to assimilate man to the immortal gods." 7. "As the German expression has it, the last judgement is the youngest day, and it is a day surpassing all days. Not that judgement is reserved for the end of time. On the contrary, justice won't wait; it is to be done at every instant, to be realized all the time, and studied also (it is to be learned). Every just act (are there any?) makes of its day the last day or - as Kafka said - the very last: a dat no longer situated in the ordinary succession of days but one that makes of the most commonplace ordinary, the extraordinary. He who has been the contemporary of the camps if forever a survivor: death will not make him die." 8. "If on Judgement Day I were summoned by St. Peter to give testimony to the used-to-be sheriff's act of kindness, I would be unable to say anything in his behalf. His confidence that my uncle and every other Black man who heard of the Klan's coming ride would scurry under their houses to hide in chicken droppings was too humiliating to hear. Without waiting for Momma's thanks, he rode out of the yard, sure that things were as they should be and that he was a gentle squire, saving those deserving serfs from the laws of the land, which he condoned." 9. 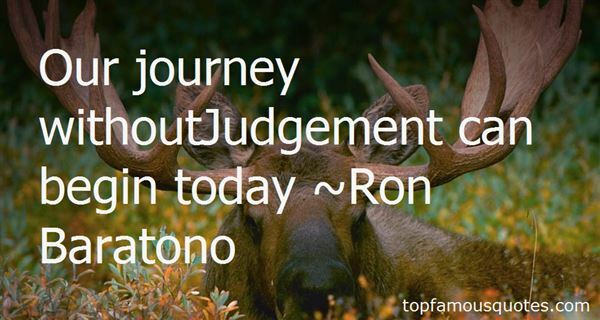 "Our journey withoutJudgement can begin today"
10. "Do you know who W.H. Auden was, Mr. Iscariot? W.H. Auden was a poet who once said, "God may reduce you on Judgement Day to tears of shame reciting by heart the poems you would have written had your life been good"…She was my poem, Mr. Iscariot. Her and the kids. But mostly her. You cashed in for silver, Mr. Iscariot. But me? Me…I threw away gold. That's a fact. That's a natural fact."